Give instant relief to your sour throat and common cold with this natural home remedy. One should have this drink empty stomach and drink it hot. 1. In a pan, heat 1 cup of water. Add all ingredients except lemon, honey and chai patti. Bring the mixture to boil. 2. Let the mixture boil for 2-3 min on medium flame, till all the flavours gets into the water. Once ready, add chai patti and immediately switch off the the flame to avoid boiling of tea. 3. Simultaneously, in a serving cup, add honey and lemon juice. Sieve the prepared water mixture into the cup and mix it well. 4. 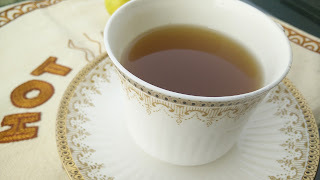 Drink this lemon honey ginger flavoured tea empty stomach to help relive sore throat and common cold. Thanks for sharing your article and for giving us the chance to read it. It is very helpful and encouraging. Visit my site too. Start your day positively and the rest will follow. Please do visit my site.Thank you and have a good day.